I am Gregory Moon Follow a recent member of the INAFA. I hold in my very hands a very Sacred Flute, story & journey~unlike any I have heard. This "Pileated Woodpecker" flute journey first resulted between the flutemaker Swampfox & myself. Since then, this amazing journey continues, with others having direct contact or hear its gifted voice. Not only has this flute journey been unbelievable, I have witnessed this flutes ability to heal, comfort & protect those believing in its powerful spirit. This flute has already become legendary here in my Northwood's Of Wisconsin area. This is a rare, rare, flute indeed. I'm in need of your support & assistance. It would honor both Swampfox & myself to have a NAF flute historian, research this spiritual flute journey and the importance of this "Pileated Woodpecker" flute. I feel in my heart this particular flute was delivered by the Creator Himself, to honor all of us. This gift needs to be shared with everyone interested in the NAF. I have documented this story & all the facts, since its arrival. It will soon be glass cased, to protect it~with an opening for those wishing to touch, see & pray with it. Possibly Swampfox and myself could play this flute at a convention and share its powerful story. This flute is past my own personnel ownership. Its journey needs to be recognized by everyone. Especially to those needing spiritual support or healing in their lives. I apologize for this lengthy Email. I'm hopeful you can assist with proper recommendations to share this gifted flute. Also the significance and research necessary to discover the meaning & importance of this remarkable journey. Many Sacred Native American Inspired Flute stories and Spiritual Legends have surfaced throughout the history of this instrument. In fact, many NAF makers believe a sacred flutes destination & home destination is decided, long before it’s completely crafted. Few flute players realize these amazing flute journey signs that take place, right before their very eyes. Even fewer recognize being selected the “Chosen One” for this great sacred honor. This story is about two people separated by many states with NO previous contact. Swampfox a highly respected and gifted flute maker from Griffin, GA and Gregory Moon Follow a full time fishing guide from the deep Northwood’s of Hazelhurst, Wisconsin. For the past 30 yrs, Greg has felt an unknown presence urging him to begin playing the Native American Inspired Flute. He never questioned why this feeling was present. Remember, these feelings appeared long before today’s popularity & growth of the Native American Inspired Flute. Moon Follow’s Flute Quest included praying daily asking for a gifted flute with a pure voice, like few other flutes carry. He prays daily that his own flute voice will strengthen & be heard by many people. If granted, he promises to share his flutes & his voice… bringing spiritual comfort to those in need. Now, Flute maker Swampfox and Gregory Moon Follow joined as brothers by the strong spirit of this amazing “Pileated Woodpecker” Flute. But the journey still continues. Greg truly believes with all his heart, this one of a kind, Pileated Woodpecker Flute is a special gift, sent by the Great Spirit to answer his personnel Flute Quest. This “Pileated Woodpecker” Flute Journey contains documented facts & all truths. The story amazingly unfolds, during a (30) day period from Dec 17, 2003, the very day the flute was purchased (thru) January 17, 2004. This remarkable flute journey is unlike any other ~ I’ve ever witnessed or heard! It’s been told to me that sacred flutes will eventually find their player! Greg first noticed this “Pileated Woodpecker” flute crafted by Brother Swampfox listed on eBay. Its voice was in the key of “E”… exactly what I had been looking for. Greg also carried a special love & respect for this mysterious creature the Pileated Woodpecker. Also known as a Logcock this Woodpecker family member can grow to 24” when fully mature. That’s huge! You can’t miss their (cuk-cuk-cuk-cuk-) call. Even their flight is graceful. I’ve heard them pecking using their huge beaks for insects on standing dead timber. It’s a loud hollow sound that can be heard for miles! Swampfox commented in his description that the “Pileated Woodpecker” Block was perfectly carved to include every feather. He was SO right! The eye of this Woodpecker Block will stare through your very sole. Moon Follow has witnessed many of these Pileated Woodpeckers flying throughout the Northwood’s Of Wisconsin. Although they rarely get close enough to humans to fully enjoy…just seeing them flying from time to time, is a gift in itself. Immediately Moon Follow felt a powerful spirit drawing this particular flute to him. Feeling this presence of strong spirit, Greg went forward, placed & won the bid and purchased the flute. After contacting his friend Swampfox sharing this strong sprit connection, they immediately knew this “Pileated Woodpecker” flute had found its home. Excited for this flute to be delivered, Moon Follow searched the mail daily, patiently waiting for it to arrive. The First Visit~Suddenly while standing near his deck, Moon Follow heard a very loud “SWOOOP, FUUUUUAH. Startled he quickly turned to research this loud noise. It sounded like a noise caused by the wings of a big bird. Greg found himself looking directly at a Giant “Pileated Woodpecker” at eye level just 10’ft away, in a large Sugar Maple tree. This “Eye To Eye” contact is highly unusual. A very rare occurrence indeed. This creature held Greg’s attention while climbing up & down the tree. It felt no-danger and visited for several minutes. I’ll never forget those piercing greenish/yellow eyes. Then without warning it quickly flew off to the East, as I watched it temporarily land in several poplar trees, but never stopping again. All I could think of was…Hey, I just ordered a NAF looking identical to that. Just minutes later the “Pileated Woodpecker” flute was delivered. Wow!!! I immediately could feel in my soul, this visit was more than coincidental. This was a direct message, meant to be sent. An honorable visit from my creature friend for me to see, with my own eyes. I couldn’t wait to share this unexpected Pileated Woodpecker visit with Swampfox & family members. Well, my friends this was only the beginning of this interesting story. After showing off this newest member of my flute collection with family, I decided it was time to play this absolutely beautiful “Pileated Woodpecker” Black Walnut “E” Native American Inspired Flute by Swampfox. Well guess what? I couldn’t play a phrase, or even a clean note. I could tell this flute had a pure voice with strong volume. Totally disappointed in myself, I continued trying to play this flute. This certainly was not the flutes fault, it was I. Sure enough, same results. I could sense something was missing. This void inside this flute was yet to be answered. Weeks later, I would learn of this powerful answer. A Second Visit~my next “Pileated Woodpecker” sighting occurred just days later. While starring out our kitchen bay window, a huge and beautiful Pileated landed on a mature Sugar Maple tree. Watching it closely, I wrote down it’s every movement on the tree. Hopeful I could mimic those movements into a song someday, I was writing as fast as my pen would allow. These (2) “Pileated Woodpecker” sightings at my residence were highly unusual. And occurred a couple days apart. I’ve lived here nearly (20) yrs and never saw even one of these creatures here before. Now I’m stunned & strongly feeling that this is much more than any ordinary flute. Is this a Special Sacred Flute that carries the gift of the “Pileated Woodpecker” itself within it! After sharing these recent sightings with Swampfox, he shared these same feelings. Swampfox~ Moon Follow, I have carved many Sacred Flutes over the years, But none as sacred as the “Pileated Woodpecker” Flute you have my friend! Still stunned I continued watching this beautiful creature move up & down the maple tree. I quickly wished again and again that a single feather would fall from its body. Since the flute arrived, I wondered if a feather would help connect it’s voice to me. But how would I ever find an authentic “Pileated Woodpecker” feather, unless I saw it fall with my own eyes! I would never harm this creature, as it is my friend. The only way is to witness a real life feather fall from this bird. I promised to use this feather to smudge across my flute bringing spirit to its voice. No sooner did I complete this wish, a jet black feather floated from its body and softly landed to the West on 10” inches of the whitest freshly fallen snow. I immediately cried and couldn’t believe with my own eyes. What I just saw happen. Then yet another mature Pileated Woodpecker appeared from the North landing in the same tree, while the other much bigger bird, flew off toward the South and out of sight. All (5) Pileated Woodpecker sightings suddenly appeared closer each time. The furthest distance 20’ ft, then 10’ ft, followed by 5’ ft and finally Greg was holding this beautiful creature in his own hands. Unbelievable!!! I quickly rushed to slip on my winter boots and without a coat rushed out into the waist deep snow looking for that single feather. I did not think I would find it, but there lying gently was this jet black feather, on top of freshly fallen white snow. As long as I live, I will never forget this. My wishes and prayers had been answered and I mean ~Right Now! I felt a haunting but safe type presence around me, like never before! Knowing I had this authentic Pileated Woodpecker feather, the only way possible, I brought it inside. I immediately placed this feather upon my flute for days before smudging it. Its flute voice was now coming to life! Sounding stronger each day. Sharing its sound with me. If you could hear our “Pileated Woodpecker” Flute voice today…believe me you would take notice! In fact every time I play this flute people are in awe of our voice. It sounds like one! Now I definitely know, I’m truly on a legendary flute journey. Almost a story becoming too unreal to share with others. Yet, I needed answers, to many unanswered questions. Why is this happening to me? Would people believe in me, when told of this story? 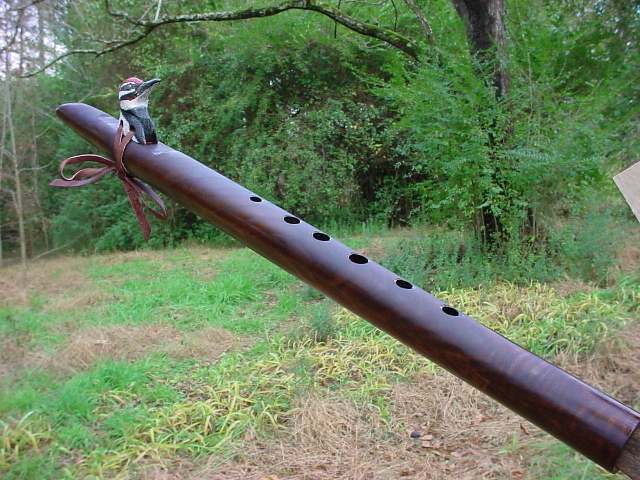 Why these increased sightings and appearances by this “Pileated Woodpecker” since purchasing this remarkable flute. Moon Follow~I’ve been Chosen to witness this remarkable flute journey! The Third Visit~ Days Later…yet another huge “Pileated Woodpecker” landed 5’ ft just outside my kitchen window as I looked through. It looked at me through the window as if to say, here I am my friend. Then it quickly flew away. I believe I was being told, that this flute journey has not yet ended! Hold On Now…this story is about to reach a new level. Into the unknown mysteries of the Native American Inspired Flute and it’s many legends. My final “Pileated Woodpecker” sighting occurred following a major Northern Wisconsin snow storm totaling (9”) inches on January 17, 2004. The Final Fourth Visit~I was out snow plowing my last remaining customers driveway before heading home at approximately 11:00/AM. This summer cabin is located on the shores of South Blue Lake near my home. This beautiful lake setting is surrounded by huge Norway & White Pines along with; you guessed it, a scenic area called Scott Springs Swamp. Yes, like in Swampfox! It was a gorgeous morning, pine tree limbs hanging heavy from the weight of fresh snow. A deep blue sky with bright sunlight made it hard to look directly at the snow. Just a great morning to be thankful to our Great Father for all these wonderful gifts he has given us to enjoy. In fact this was the exact Eastern location & direction, I watched that first guest “Pileated Woodpecker” fly away toward from the maple tree. You remember that first woodpecker visit, don’t you? Yes, that’s the one, the same day the flute was delivered. ALL (5) “Pileated Woodpecker” visits immediately followed snowstorms! As I lowered my snow blade down to push the driveway entrance open, I felt a sudden need to stop plowing. Why I immediately put the brakes on-I’ll never know. No one had driven or walked this road that day, as there were not any tracks in sight. As I looked through my driver’s side window, my friends, I could not believe what I was seeing. I just wanted to cry out to the heavens asking why this happened to my spirit friend. Lying on its back in the freshly fallen bleach white snow was this beautiful mature “Pileated Woodpecker” barely alive. I rushed out; I simply asked it, how did this happen my friend? Who hurt you? Were you sent here? I am here now! I cried! As I placed my hands under the snow to lift this awesome creature in need, I wondered how it got there? There were no marks anywhere in the snow. No signs of struggle or harm. Weird, no snowflakes covering it – it had to have gently been placed there. As if that was intended. Finally it moved its head slightly before it died in my warm hands. Almost like it searched for me to find it, giving many signs along the journey. I believe in my heart that the Great Spirit placed this “Pileated Woodpecker” there. In perfect condition, not knowing how it got there was this beautiful “Pileated Woodpecker” resting in my hands. The end of its gracious wonderful journey on earth. I have only been witness to seeing a few “Pileated Woodpeckers” from long distances in the wild. Never close up! This during my (50yr) lifetime living in the Northwood’s Of Wisconsin. They are a rare and privileged sight seeing them gracefully flying through the tall majestic woodland pines. I then prayed and brought this friend home. I did not want my family to see my tired red face from crying. I would share this day’s legend with them on another day. I was mentally drained, shocked by what took place and needed immediate wisdom from my Chippewa friends and Winnebago (My Heritage) Elders. Their comments are listed below from many years of wisdom. Never underestimate the sacred power of the Native American Inspired Flute; its gifted spirit and legend! To this day, I will never fully understand what happened! I will never forget it! Not in this lifetime or any lifetime! Gregory Moon Follow. My close Native American friend Lyle Chapman a registered member of the (Lake Superior Band) Of Chippewa recently drove (35) miles in a 12” blizzard from his Lac Du Flambeau reservation residence, feeling compelled just to see and hold this great “spirit sent” flute for himself. He held this sacred flute in his hands without as much as speaking a word! These Native American beliefs are being shared with you, because you have been involved as part of my Flute Quest Journey. I consider you all part of this wonderful story. I only ask that you do not share this story without my permission as asked of me. Gregory Moon Follow. Sissy Chapman~Gregory Moon Follow… Allot of theories and interpretations from different Elders are available. You believe your heart and go forward with the Chosen One! Sissy Chapman~These spiritual stories happen to many, however few people take notice this sacred event is happening. Chris Moore~This strong “Pileated Woodpecker” spirit appeared when Greg selected this specific flute/pipe from flute maker Swampfox. Greg felt a deep need to have this flute with him. Lyle Chapman~This “Pileated Woodpecker” is Greg's Spiritual Guide. This creature gave its life for his Flute Quest Journey” & wishes. Greg's wish is to play the flute for spiritual growth, comforting, healing and opportunities to help others in need. Chris Moore 1st visit~ Landed in Maple tree 10' ft from Greg. Looked at Greg eye to eye level. Stayed for 10-minutes moving up and down tree trunk occasionally stopping to look at Moon Follow. Flew off to the (East) landing from tree to tree without stopping. Greg found spirit bird in the Eastern Door. Opened East Door: Pileated woodpecker flying into the East direction. Means me coming to terms with my own adult self. What I'm currently doing with my life. Spirit Plate Offering~Provide Family Dinner & Spirit Plate Offering: Make a spirit plate feast~small dish and place in the Eastern Door. Sprinkle tobacco & pray on it. Chris Moore 2nd visit~ (2)-Pileated Woodpeckers sighted together. One following the other. The first dropping a black feather after Greg prayed & wished this to happen. The feather fell from the woodpecker immediately after Greg wished this. It started cleaning its feathers with its long beak around the breast & neck area. Opened Southern Door. Means I carry full truth & innocence. I’m doing the right thing and on the right path. Sissy Chapman 3rd Visit~ Greg spots Pileated Woodpecker on Bird Feeder post. Quickly fly’s off ~as to catch Greg's attention then leave. Quickly disappeared never stopping. Opened the Northern Door. 4th visit~ Greg finds dying Pileated Woodpecker. Greg picked up creature as it moved slightly in his hands before dying. No marks made in snow. Bird in perfect condition. Like being placed there to be found. Lyle Chapman Death of Pileated Woodpecker. Moon Follow, do not be afraid. Chippewa Native Americans do not believe death is bad. This creature is part your own spirit. Moon Follow~Greg had spotted (3) Pileated Woodpeckers on different days within 2 wks. The 4th and final time was when Greg found the dying bird. It died in his hands as if it were waiting for Greg to find it. Woodpecker was found lying on its back, in the snow with no-marks around it or snow flakes covering it. It just happened. Like it landed without as much as a mark in the snow. Sissy Chapman & Chris Moore~ Opened Western Door: The next beyond. Greg must bury his creature with its feet facing the Western Door. Moon Follow will bury this “Pileated Woodpecker” with great honor. Lyle Chapman Flute Pipe Dress~ Greg must smudge down his flute pipe (once) with his “Pileated Woodpecker. He will remove a couple feathers to dress his flute. Greg must then bury creature in the Western Door. Lyle Chapman Swampfox Flute Maker~Has been making spiritual flute pipes for 18 yrs. Greg & Swampfox consider themselves brothers brought forward by this connection. 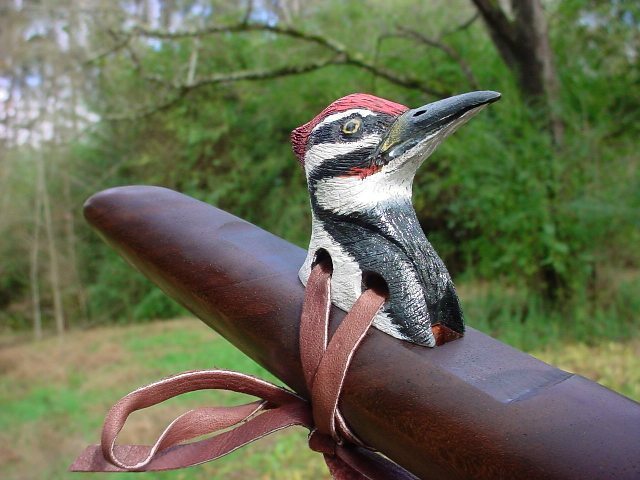 Swampfox ‘s word is that this “Pileated Woodpecker” flute is the finest he has crafted. Swampfox feels the spirit of this creature is inside the flute. Lyle (FI) Chapman~Moon Follow must honor Swampfox~ Greg will send the same feather dress to his brother Swampfox. This will complete the circle back to him. Greg must also send Swampfox a tobacco pouch with buckskin strapping. He will pray and give Great Thanks for these gifts. Pray For Thanks~Greg must return soon to the exact site where he found the Pileated Woodpecker. He will pray there in quiet until comfortable with his journey. Giving thanks to the Great Father & his own spirit creature. Final Comment~ Greg has asked his family to honor his wishes of returning this “Pileated Woodpecker” flute to Swampfox one day.